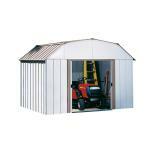 Discussion in 'First Time Marijuana Growers' started by an0nym0us, Jun 8, 2006.
hey city, my dad got a beand new 10x14 aluminum shed like the one in the picture for FREE!! should i use the building and if i do want should i do to keep it from getting so hot ? See if i use the building i cant put like 20 plants or more in it and also it has no floor .... so i could fill the underneath of the shed with new soil and put like seperate boxes in the ground so the roots dont mixx what do yall here in the city think ? It can work good. Where are you growing now? my first grow was in a similar building and while it was a good learning experience and the end result was very good smoke, i would not recommend it unless maybe it is the only option. i am several hours north of OK and the heat was still crazy. i was seeing 100+ on a very regular basis and 110+ pretty frequently. i think the highest was about 116 degrees. contrary to a lot of what i've read, it didn't kill my girls, but it did slow things WAAAAAAAY down. i ended up with about 3 oz. but it took about 7 months to complete. when i moved indoors for grow number 2 i ended up getting almost 4 oz. in about half the time even though i only have about 3 feet of height and that includes room for the light. Temps will be a big issue to contend with in that shed.